The DFRobot 4WD Arduino Mobile Platform is intended for use with the DFRobot RoMeo Microcontroller. It includes 4 drive motors, 4 wheels and an attachable chassis. The chassis can be mounted on top of the base of the 4WD Mobile Platform -- by serving as a "second level," the chassis allows you to add more electronics (such as sensors, etc) while also providing space for a standard servo motor. The body of the 4WD Mobile Platform is comprised of high-strength aluminum alloy, which makes it both sturdy and lightweight. This makes it ideal for use on outdoor grass, gravel, sand or sloped surfaces, to name a few. Through use of the RoMeo Microcontroller, Bluetooth, and its capacity for servos and additional electronics, the 4WD Arduino Mobile Platform is highly customizable, making it well-suited for robot competitions and research-related projects. 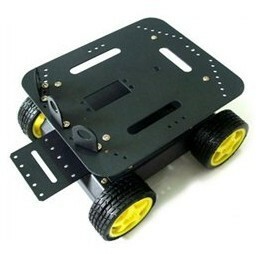 Get 4WD Mobile Platform from DFRobot Store or DFRobot Distributor.